Today I was part of a panel session at a4uexpo in London talking about “Engaging Facebook through EdgeRank, Content Optimisation and Killer Apps” alongside Kelvin Newman and Jeremy Waite. Kelvin Newman took the audience through the elements of Facebook’s EdgeRank algorithm, explaining how what the user sees in their news feed is calculated by looking at the affinity the user has with the publisher, the weight of the content item in terms of type and interactions generated, and the decay of how long ago it was posted. He explained how you need to work all of these factors into your approach to social media marketing. He gave the example of a typical launch, where in the last couple of weeks you are bunkered down trying to get everything ready for “the big reveal”. Your social media voice tends to go a little quiet because you are not frantically pushing the old branding or products or services. This, he said, is exactly the opposite of what you need to need to get a big splash in the Facebook news feed. Instead you need to have an “affinity acquisition approach” which builds up to the launch. In order for the big moment to rank well, you need customers and an audience who are already engaging with your Facebook content. That means you need to be teasing it, talking about it, and making it part of a social conversation before the launch happens. You also, he said, need really good assets. The Sky Pro Cycling Team are really good at this, he suggested as an example, because they always have great behind the scenes and race photos to share, and a range of personalities in the team to expose on social media. He talked about needing great content to punch through, but also the fact that something like 96% of people who ‘Like’ a brand page only visit it once. What is important to note, he said, is that 66% of users have ‘Liked’ five brands or less. That means that your social media presence is unlikely to be competing for space in the news feed against other banks or insurers or whatever vertical you work on, but you will be competing instead with Lady GaGa and Coca-Cola. You also have to bear in mind that not every fan will see every piece of content you publish - and Facebook is unique in that regard as a social media platform. Some people have complained that this amounts to Facebook being able to censor your content, but Jeremy quoted Mark Zuckerberg as saying that all content should be as engaging and as compelling as that which comes from a user’s friends and family. A tough ask for a lot of brands. Jeremy suggested people should try the EdgeRank checker to get an idea on how their items were performing in Facebook’s space. 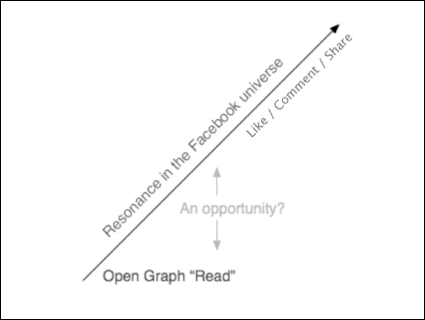 I was presenting a case study of building the Guardian’s social reading Facebook app, and looking at how I think brands need to find ways to enable the transmission of their content through the Facebook network in a more sophisticated way than simply using the “Read” action from the Open Graph. You can find me on Facebook at facebook.com/currybet. By Martin Belam on 17 October 2012.